Spotlight on City of Islands by Kali Wallace, Plus Excerpt & Giveaway! 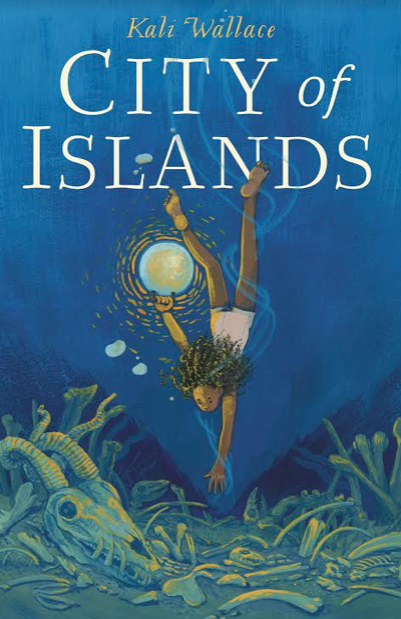 Today we're excited to spotlight City of Islands by Kali Wallace! Read on for more about Kali and her book, plus an excerpt & giveaway! Kali Wallace is the author of two novels for teens and many short stories. She studied geology for years, but now devotes her time to writing. She lives in southern California. Mara is a diver for the Lady of the Tides in the City of Islands, a foggy, magical archipelago. Orphaned as a little girl, she was taken in by a bone mage named Bindy—but when Bindy was killed under mysterious circumstances, Mara was taken in by the Lady. Day in and day out, Mara swims through the murky ocean between the city’s many islands, searching for treasures that might please the Lady. Until the day Mara discovers the skeletons of strange hybrid creatures—a lizard with wings, a sea snake with a tale, a seal with claws—all humming with a magical spell song. Mara is convinced that such a rare, unusual find will afford her the opportunity to study magic—the only source of power in the islands, and the only sure way out of poverty. But rather than rewarding Mara with an education, the Lady gives her a challenge: sneak into the Winter’s Blade, an asylum island ruled by the Lord of the Muck, to get to the bottom of where the magical bones came from. What Mara finds there is more dangerous and chilling than she—or anyone—could have ever imagined. One winner will receive a copy of City of Islands (US only). Spotlight on Rosie Girl (Julie Shepard), Plus Excerpt, and Giveaway! Spotlight on Now I Rise by Kiersten White, Plus Excerpt & Giveaway! Spotlight on The Wood (Chelsea Bobulski), Plus Excerpt & Giveaway! The cover is beautiful and the synopsis sounds amazing! The cover is beautiful and the synopsis sounds fascinating. The cover is gorgeous and I love the premise and setting too.